Mid 18thc highly decorative Sinhalese (Sri Lankan) padouk, brass & studded traders chest. 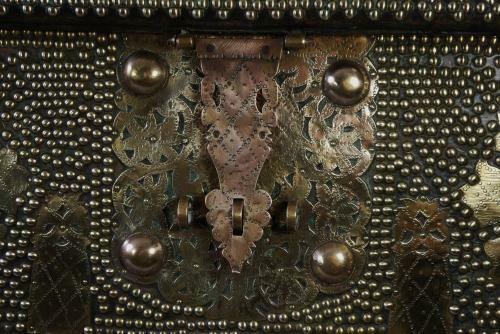 The front panel is covered with brass studs & brass & copper metalwork pierced & stamped with various designs. It sits on a stand which is not original to the chest. This particular stand was made around 1900 & is made of teak. The original stand was probably lost at some point throughout its many travels. This piece is highly decorative & would fit into a period setting but equally would look stylish in a modern property against a white background.